At a Senate hearing in July, the State Department called marine debris "the real sea monster" and said the oceans could hold more plastic than fish by 2050 if current trends aren't reversed (E&E Daily, July 26). At the same time, NOAA called for more research and prevention to stop "a global problem," warning that sea garbage is causing more navigational hazards and collision dangers. But in August, the Trump team took a different turn, angering environmentalists by rescinding a 2011 policy that encouraged national parks to eliminate the sale of disposable water bottles (Greenwire, Aug. 17). "It's an inconsistent message — it's hypocrisy, and it shows an extraordinary lack of ability to govern and insensitivity to an extraordinarily important issue in our national parks," said Democratic Rep. Mike Quigley of Illinois, vice chairman of the House Sustainable Energy and Environment Coalition, who wants to reinstate the ban on plastic bottles. The National Park Service scrapped the ban even though an internal study showed that it had been effective, saving up to 2 million water bottles each year and preventing 5,000 pounds of plastic from entering the waste stream (Greenwire, Sept. 26). When NPS released the report in September as part of a response to a Freedom of Information Act request, officials said it had been designed to help NPS leaders understand the new policy but that the agency "lacked the data necessary to ensure the report's findings." "There's a touch of irony there," said Jonathan Jarvis, the former NPS director who put the ban into effect six years ago. But Jarvis said there's an easy explanation: Neither the State Department nor NOAA had to contend with the power of the plastic water bottle industry, which carries much clout on Capitol Hill. "To stand up and say we need to clean up the oceans, you're not really pointing your finger at anybody in particular — it's a feel-good statement that they can make," Jarvis said. "The elimination of the water bottles in the National Park Service impacts a very specific industry. ... They're basically taking a product that is essentially free — water — and putting it in a bottle and selling it for 2 bucks. I mean, I can see why they're upset." And Jarvis said the ban was unpopular with many members of Congress "almost from the get-go." "It just happened that most of those members of Congress happened to come from states that had major bottling plants," he said. NPS said it rescinded the policy as a way "to expand hydration options" for park visitors. Acting NPS Director Michael Reynolds said the move would allow visitors "to decide how best to keep themselves and their families hydrated." It marked a victory for the International Bottled Water Association, which argued that the NPS policy was "seriously flawed," noting that parks that banned water bottles still allowed sales of bottled sweetened drinks. "Consumers are choosing bottled water instead of less-healthy drinks, and they are expecting it to be available wherever other packaged beverages are sold," said Jill Culora, the association's vice president of communications. For Dune Ives, the decision by NPS made no sense. She's the executive director of Lonely Whale, an organization that led a campaign called "Strawless in Seattle," which removed 2.3 million straws from city restaurants and businesses during the month of September. "I'm definitely not an expert in deciphering the Trump administration — I don't know who is — but what I can tell you is I really see a lot of inconsistencies," Ives said. "For us, when we look at the issue of ocean health, we know that change is going to have to come from the street, from the people. We can't rely on our policymakers to ensure that we have a healthy environment." Ives said the campaign to get rid of plastic straws was designed as "a conversation starter" to get people to think about how they can reduce marine litter. "Plastic pollution is now getting into our water, and it's getting into our fish," she said. "A report just came out about single-use plastic showing up in sea salt, so nobody is immune from this. It's just like climate change." As the trash piles up, groups are sounding more alarms. In September, environmentalists worried that discoveries of large polystyrene chunks in ice floes not far from the North Pole would pollute previously pristine waters of the Arctic Ocean. The Slava Foundation, a group trying to raise awareness of the issue, put the blame on global warming, saying ice that once acted as a barrier is now melting more quickly and that the rapid thawing has led to an increased flow of plastic pollution. Former Vice President Al Gore joined the cause in September, becoming the first honorary citizen of "Trash Isles," an area of floating trash in the North Pacific Ocean that has grown to the size of France. As a way to publicize the need for cleanup, Gore and other environmentalists said the trash heap had become so large that it deserved to be recognized as a country by the United Nations — Gore even showed off his Trash Isles "passport." Jarvis said he got a glimpse of the destruction when he visited the remote Midway Islands in the northern Pacific in 2010, watching what happened when albatrosses fed plastic trash to their chicks. "They just stuff them full of plastic, and the babies die," Jarvis said. 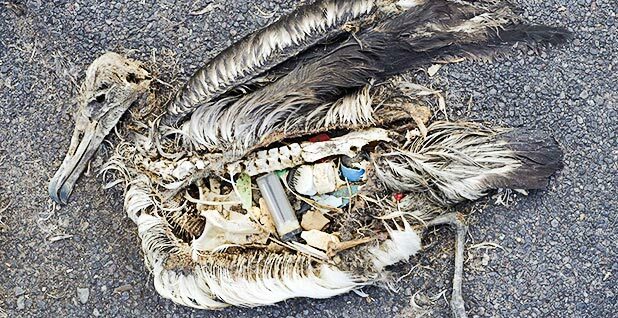 "As you walk around, you'll see these carcasses of baby albatrosses on the ground — they're split open, and you'll see cigarette lighters, toothbrushes, pieces of plastic water bottles, a whole little line-up of plastic that have been stuffed into these birds. ... You're thousands of miles from anywhere, and the beaches are incredibly littered with plastic. It just blows you away." A year after his trip, Jarvis put the ban on plastic water bottles into effect. "We need to hold ourselves to a high standard," he said. The issue emerged last week when a U.N. environmental summit opened in Nairobi, Kenya. Erik Solheim, executive director of the the U.N. 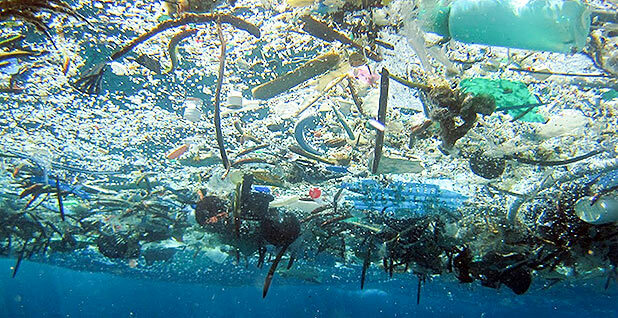 Environment Programme and undersecretary-general of the United Nations, told CBS News that the world is now facing "an ocean Armageddon" by dumping at least 8 million tons of plastics into the oceans every year. More than 200 nations signed a U.N. resolution that called for the eventual elimination of plastic trash in the oceans, a move that some hope will lead to a legally binding treaty. For its part, the Trump administration says it is working to elevate the issue of plastic pollution both at home and across the world. At the July hearing, Nancy Wallace, who heads NOAA's marine debris program, told a Senate subcommittee that the agency is funding research and cleanup programs across the country, now leading an effort with states to develop "marine debris action plans." She said NOAA is also helping organize an international marine debris conference that's expected to draw more than 600 participants to San Diego in March of next year. And David Balton, deputy assistant secretary of State for oceans and fisheries, said the United States is particularly focused on East Asian countries, which account for more than half of the plastic waste leaking into the oceans. He said their economies are expanding rapidly and that their waste handling systems are not keeping pace. Park officials said that only 23 of the 417 NPS sites had eliminated the sale of disposable plastic water bottles and noted that Congress asked NPS to review the policy and suspend its implementation as part of its 2017 omnibus appropriations bill. Jeremy Barnum, acting chief of public affairs for NPS, said the decision to scrap the ban "still stands" but that parks continue to promote recycling and that many parks provide free water filling stations at visitor centers and near trailheads. "If concessionaires wish to continue or initiate a disposable water bottle reduction program, they may do so as an independent business decision, but must do so in close consultation with park management to ensure the safety of visitors and the protection of the park's resources," Barnum said. Quigley said he wants his fellow lawmakers to act by reinstating the guidelines that allowed NPS to ban the sale of single-use plastic water bottles, arguing that 70 percent of them now find their way to landfills and waterways. His bill, the "Reducing Waste in National Parks Act," (H.R. 3768), would make the rescinded policy permanent, but it has yet to receive a hearing (E&E Daily, Sept. 15). Quigley called the ban "an easy, common-sense plan that people get" and a method that has been proven to work, but he said he's not banking on any support from the Trump team — regardless of the evidence. "They're not into science, and they're not into facts," Quigley said.